Start with an excellent fillet of organic Char. Treat it with the simple care it deserves and you will be gifted with a wonderful meal. Undercooking is always the better choice, and a light basting sauce adds a delicious glaze. From my point of view, that’s what good cooking is all about, simplicity and permitting the flavor of what’s being cooked to dominate. 1. Season the Char. Set aside. 2. In a small saucepan, melt the Butter along with the EVOO. Add the Balsamic Vinegar, whisking to emulsify the ingredients. Reduce to consistency of coating the spoon. This will be the basting sauce. Set aside. 3. Heat a saute pan to medium high, add the tsp of EVOO, & the fish skin side down. 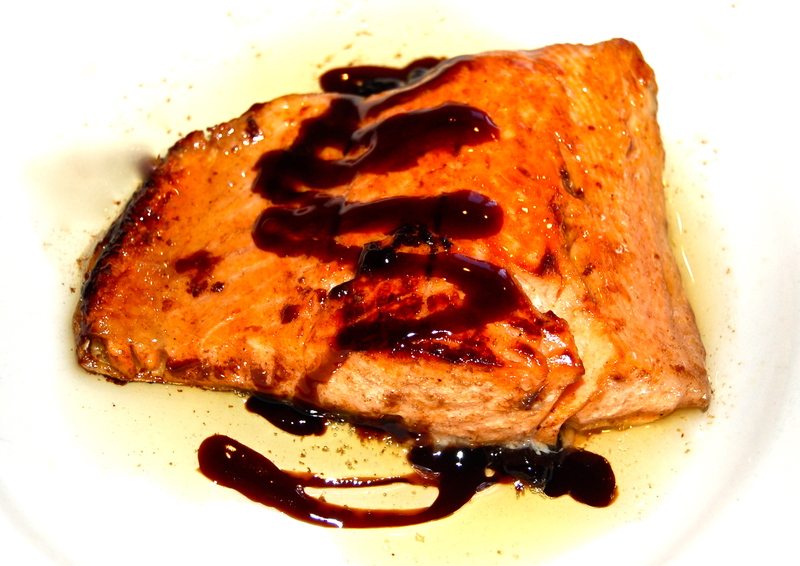 Cook for a few minutes & add the basting sauce, spooning the sauce continuously over the fish. Cover the pan, lower the heat, & in about 5 minutes the fish will be ready to plate.